February 1st! Goodness…Valentine’s Day is a mere 14 days away and we couldn’t be more excited to share some unique chocolate treats with you ! 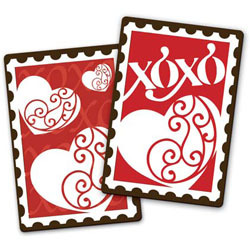 These premium dark chocolate heart stamps are a perfect little adornment to a postcard cookie. Simply use a rectangular cookie cutter to cut-out shapes from a batch of our yummy No Fail Sugar Cookie Dough. Then use royal icing to decorate the cookies as you wish (a love letter, perhaps?) and affix the stamp with a dab of icing, just as you would a traditional postcard! 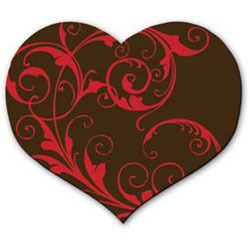 Also new to fancyflours.com are these lovely dark chocolate hearts with red and white scroll patterns. These little treats are so beautiful and could be served in a small dish on their own or could be used to jazz up some store bought (or handmade, of course) cupcakes. The hearts are about 1 3/4″ x 1 1/2″ so they are the perfect match for mini or regular sized cupcakes. The scroll is made from cocoa butter based chocolate transfer sheets, which is another trick you could try on your own. View our chocolate transfer instructions for details on working with these inspiring sheets – just another tool to add to your baking repertoire. A Cookie Garden in Full Bloom! This cookie garden is in full bloom! 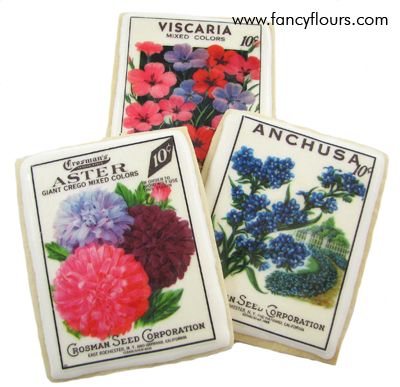 Our stunning Vintage Seed Packet Wafer Paper is unique, beautiful and easy to use. 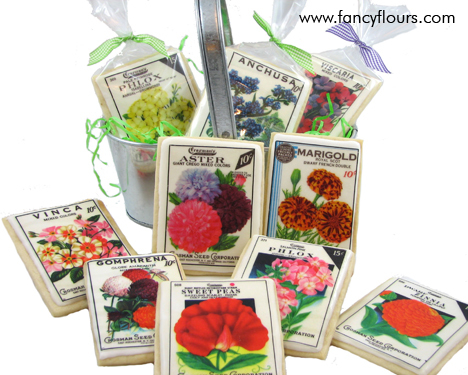 A variety of floral designs cover the rectangular wafer paper shapes. The set comes with 12 shapes, each measuring 3″ X 4.5″. We like to use the 5″ X 3.25″ Rectangular Cookie Cutter – it fits the shapes perfectly. To make these lovely cookies please click HERE for our HOW-TO Recipes section and watch your cookie garden grow!